Maneuverable, versatile, high-capacity waste collection and sortation system. 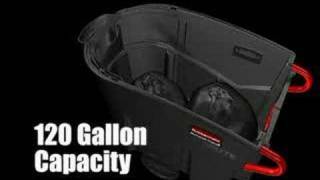 The Rubbermaid Mega Brute Mobile Waste Collector features to 120 gallons or 400 lbs. trash capacity. Ergonomic rear doors allow easy waste removal to reduce worker strain. Integrated storage area holds trash can liners and janitorial cleaning supplies. Large 12" wheels and locking 5" non-marking swivel casters are mounted in “diamond” pattern for 360° rotation. Trash can liner retainer secures a 55-gallon liner and flips up for access to waste storage area. A must-have piece of equipment for facility maintenance staff, housekeeping and cleaning services. Shown with Mega Brute Lid, RCP 9W72, sold separately. Can be used with a Slim Jim® container (RCP3540, RCP3541; sold separately). Dimensions: 52-1/2"L x 27-1/2"W x 42-1/2"H; 120 gallon/400 pound capacity.